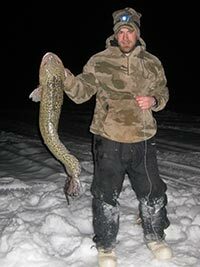 Ice fishing for burbot is a great way to get out and enjoy the outdoors during winter. Burbot are fun to catch and great to eat. Burbot (Lota lota) are the only freshwater member of the cod family and are found throughout Alaska in rivers and lakes. They have a very unique appearance with green and brown mottled skin, and a barbel (sometimes referred to as a “chin whisker”) similar to those found on catfish. In Alaska, burbot may live up to 20 years or more and become sexually mature by age 5-7. Like all cods, burbot spawn in winter. Burbot are “broadcast spawners”, which means they spawn in large aggregations in the open water column. As adults, burbot primarily feed on other fish. In Alaska, their preferred species to eat are whitefish, suckers, lampreys, Arctic grayling and occasionally, even other burbot. For more information, view the species profile for burbot. Burbot feed primarily at night. They can be caught year round using standard bait fishing techniques. In some areas of the State, set lines are allowed. This fishing technique is, in some ways, similar to trapping. An angler sets bait on a fixed line, and leaves it to fish overnight. While set lines can be effective year round, it is often done through the ice during the winter months. You must have a current sport fishing license to fish for burbot. Buy a license online. Each set must be labeled with your name and address. Each set must be checked at least once a day. 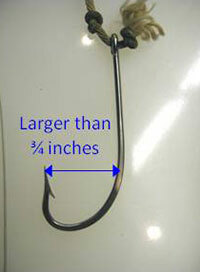 You must use single hooks with a gap between point and shank larger than 3/4 of an inch. Each hook must be set to rest on the bottom of the lake or river. You’re allowed to have as many hooks out as the daily bag limit for burbot. More than one hook may be attached to each set line. As described in the How to Set Line for Burbot video, there are two general techniques for creating set lines: the strong line method and the pole set method. Each technique has advantages and disadvantages. 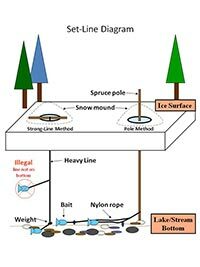 The pole set method is often used in shallower water and in situations where an angler will continue to fish the same hole for a week or more. Since the pole keeps the line down on the bottom, it is often unnecessary to use sinkers. An advantage of the strong line method is that the gear is easy to pack and transport. A single 5-gallon bucket can be used to carry many sets made from dowels. In order to ensure that each hook rests on the bottom when using the strong line method, it’s a good idea to use at least an 8-ounce sinker for each set. For more detailed information about set lining for burbot, see Setlining for Burbot Through the Ice (PDF 1,461 kB). In Interior Alaska, burbot are abundant in large glacial river systems such as the Tanana, Yukon, Kuskokwim, and Copper Rivers, and these rivers are your best bets for bringing home a stringer of burbot. Burbot also reside year-round in smaller, clearwater tributaries, but tend to be less abundant and therefore harder to catch in these systems. 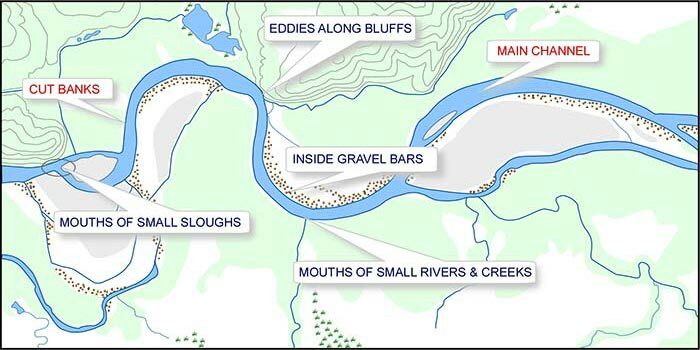 Below is a typical depiction of a large, glacial river showing areas you should target for fishing and areas you should avoid fishing in. A wide variety of bait can be used for burbot, but fresh fish baits such as whitefish, herring, squid, or smelt are consistently the most effective. Other baits such as catfish cheese, power baits, worms, salmon roe, and even chicken liver have been used successfully to catch burbot, but generally don’t work as well as fresh fish baits. The viscera (heads, tails, fins and guts) of sport caught fish, such as salmon or trout, can also be used. However, you are not allowed to use the meat of any sport caught fish. Burbot have very large mouths, so large chunks of bait can be used. Big baits catch big fish! Remember, to change your bait every day, if possible, since burbot prefer fresh meat! After you have successfully caught a burbot or two, you will want to prepare them for eating. The How to Clean Burbot video shows the technique for cleaning and filleting your catch. In addition, you can download the ADF&G publication, Filleting Your Burbot (PDF 1,863 kB). Many Alaskans consider burbot to be one of the best tasting fish, rivaling salmon or halibut. The white meat is flaky and can be prepared in a variety of ways. Beer-battered, deep-fried burbot is a particular favorite among anglers. Download Burbot Recipes (PDF 723 kB), a free ADF&G publication that provides a number of tasty ways to prepare your catch.